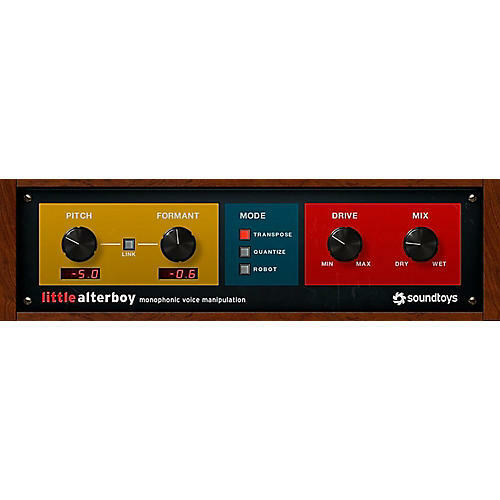 Little AlterBoy is Soundtoys’ exciting new tool for dramatic voice alteration. Get a huge range of vocal transformations from one simple plug-in. Change the pitch of a voice, or change the singer’s gender with formant shifting. Lock onto a single pitch for robotic sounds. You can even control the vocal’s melody using MIDI for creative vocoder-like effects. Want that overly popular pitch-quantized hard-tune effect? Yep, Little AlterBoy has you covered. Plus, one of the classic tube saturation models from Decapitator is included to add warmth and edge to your new vocal creation. Once you’ve crafted your perfect vocal effect signature, you can use MIDI in your DAW to control the pitch for dramatic vocoder or harmony effects. It’s a hugely powerful way to find new directions and drive new ideas. Soundtoys founders were part of the team that created the Eventide H3000, one of the most iconic pitch-shifters of all time. They went on to start a company called Wave Mechanics (soon to be called Soundtoys), which created the first real-time pitch and formant shifter: PurePitch TDM. Back in the ProTools TDM years, SoundToys also produced other high quality pitch-based effects including the acclaimed PitchDoctor and SoundBlender. With Little AlterBoy, they've istilled all of that knowledge to create a potent little vocal tool. It gives you a wide range of the most popular vocal effects of the day, and the freedom to create your own signature sounds, too.